It was the black and green ESM Nissan of Pipo Derani that swept to the pole in qualifying yesterday, but it was the Cadillacs back on top after a short street-course back and forth battle with Acura. This race, again, showed that IMSA is the greatest series for sports cars in the world right now, and if you didn’t catch it live, you’ll need to watch the replay, because it was supremely entertaining. Just three laps into the race, prototype phenom Derani slowed with apparent steering issues. Just a few laps later and the fast Mazda of Jonathan Bomarito was pitting with a chunky driveshaft. This opened the door for the Acuras of Team Penske to move to the point just ahead of a full course yellow for debris about 20 minutes into the motor race. While the majority of the leaders pitted for fuel and tires, it was Joao Barboasa staying out in favor of track position that moved him to the lead. 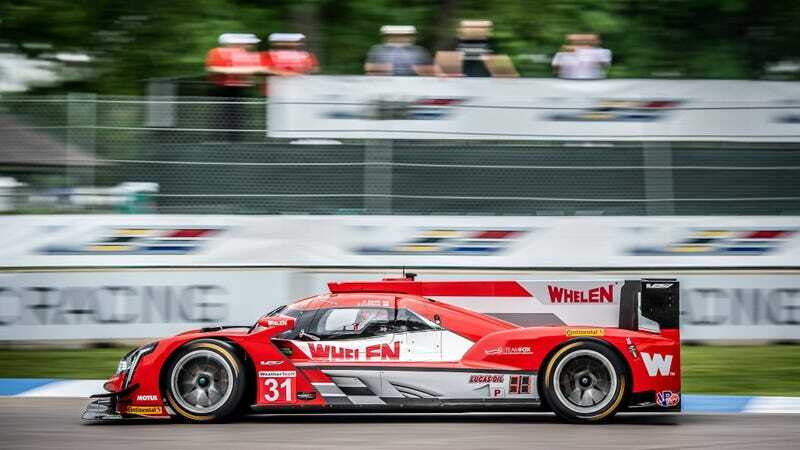 When Barbosa pitted at just before the half-way point in the 1 hour 50 minute race, Team Penske was setting up an Acura 1-2. Running a superior strategy, Eric Curran kept the Whelen Action Express car out of trouble for the opening stint, and then pitted the car as soon as they were within the fuel window. Only the Mustang Sampling Action Express sister car managed to run the full race on just one fuel stop, meaning they had a full stop’s worth of time advantage. At a narrow street circuit like Belle Isle, track position is infinitely more important than tires. Once Curran handed off the car to Felipe Nasr, it was off like a rocket, climbing up the leader board as the other cars pitted for their second time. Once he’d moved into the lead, Nasr managed the gap to second, and secured the victory. Well won, for sure. In the GTD class, Acura was in the running all day, having qualified second and third on the grid. In the opening stint it was Katherine Legge in the Meyer-Shank Acura NSX holding on to the rear bumper of the pole-sitting Lamborghini of Bryan Sellers. That tenacity paid off when Shank decided to give both of the Acuras left-side-tires only during their only pit stop to jump them into the lead of the race. Legge stayed out one lap longer than teammate Justin Marks, and that made all the difference. She handed off to Mario Farnbacher who returned to the track ahead of Marks’ replacement Lawson Aschenbach and the Lamborghini behind. That was the running order to the flag. Legge also won this race at Detroit last year, giving Acura its first competition victory teamed with Andy Lally—who has since returned to driving Audis for Magnus Racing.